Download and print our brochure now! 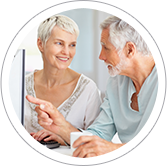 Our goal is to provide the best possible hearing health care based upon your individual needs. We provide a comprehensive array of services related to prevention, evaluation and rehabilitation of the hearing-impaired. Services include otoscopy, cerumen management, comprehensive and specialized diagnostic hearing evaluations, counseling, repair and maintenance of hearing devices, assistive listening devices and other products for the hearing-impaired. Choosing an audiologist is one of the most important decisions a hearing-impaired person can make. It is important to realize that fitting a hearing instrument is not an exact science. Equipment and training, while important, are not enough. The audiologist will listen to your specific needs, offer effective counseling regarding the available options for assistance and design an individualized solution for a variety of communication environments. You can rely on continuous support and professional hearing health care long after your fitting. Dr. Sally E. Muhlbach is a board certified audiologist with over 20 years of experience performing comprehensive diagnostic hearing evaluations to determine the specific type of hearing help needed. She is a fellow of the American Academy of Audiology and member of the Academy of Doctors of Audiology, the Texas Academy of Audiology and the American Tinnitus Association. Each person’s hearing is unique and all hearing losses are different. We believe that it is vital to educate our patients on the key factors in finding the best solution for their hearing needs which is tailored for their life style. Matching each patient’s needs with the right technology is the best way to enhance hearing and reconnect to the sounds of life. Our trained staff is dedicated to providing patients with an exceptional customer experience with service second-to-none. 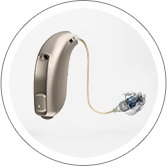 It starts with the first appointment and continues throughout the process of wearing hearing devices. We believe that well-maintained hearing instruments are necessary for optimal performance; we provide an outstanding array of services, education and follow-up. Each member of our team is trained and committed to welcoming all who enter our door with professional service, integrity and a smile. We are never too busy to assist our patients with their hearing health. We work as a team to go the extra mile to solve the issue no matter how small or large. We love what we do. 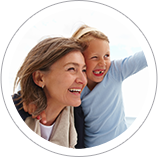 We are passionate about helping our patients and their families enhance their quality of life through better hearing. We provide our best effort each and every time you visit our office because we care and appreciate the trust you place in us as your hearing health care provider.